Marissa Farrar: Epic Kindle Giveaway! Some mornings you wake up with no idea of exciting things the day may hold. Scott Nicholson, Russell Blake, Claude Bouchard, Jeff Bennington, Ian Woodhead, John O'Dowd, and John Hartness. 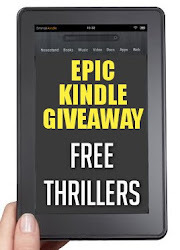 So what's the epic kindle giveaway all about? Well, it's all about giving away great thriller, horror, mystery and suspense titles for the kindle. So, if you enjoy any of those genres (and by the fact you're on my page, I'm going to guess that you do!) make sure you follow the blogsite or head on over to the facebook page where you can stay informed about all the brand new titles that are popping up for FREE every day! And if you don't have a kindle yet, you can download the 'kindle for pc.' app which is also free. That way, you can still make the most of all these free ebooks and when you get a kindle (notice I said, 'when' rather than 'if') your brand new, shiny kindle will automatically update with all the books you've been collecting. Sounds really great, Marissa. My computer is so jacked up I can't download an app for the Kindle, and I gave my kids kindles, but I don't have one. :( I need to change that!